It’s March and we all know what that means: every writer across the nation is baking up their hottest takes to ultimately not be held accountable at the end of the season. Well ASA is allowing me to put their upstanding reputation on the line with five predictions for MLS’s gloved men heading into the 2016 season. Make sure to bookmark this post so you can link it to everyone at ASA in eight months and give us a boost in hits come November! 1. Luis Robles and David Ousted will duke it out for Goalkeeper of the Year again - If there’s one thing that has proven consistent with the award, the goalkeeper on the team who wins their conference has a great shot of winning the award. Dating back to when the league split to two conferences, ten of the fourteen years GOTY winners have gone to goalkeepers whose teams finished first in their conference. This means Tim Melia (SKC) and Clint Irwin (Toronto) also have a decent shot but Robles and Ousted are the best bets. It’s a rare sight to see either goalkeeper costing their team points in a game and both of their teams are looking to challenge for the Supporters’ Shield again. Four more predictions after the jump. This is merely a trial run. I say that because in the last two days I've limited the collection of data and then expanded it. It comes down to how it tickles my fancy. The data I have collected is limited for the time being to the Chicago Fire as just a means of comparing a club and its data to the league and trying to make sense of it. This hopefully will develop into the means of how I can some how attribute value to clubs and their keepers in the future. Below is a picture of the goal mouth, and the data has been collected from the website Sqwuaka.com. Coupled with a previously built image, you can see how Chicago compares to the rest of the league and how a majority of their goals have been scored this season. While numbers are always an important thing, remember that it's more about ratios and the average occurrence than pure accumulation at this juncture. Not all teams have played the same amount of games and they haven't had the same opportunities. 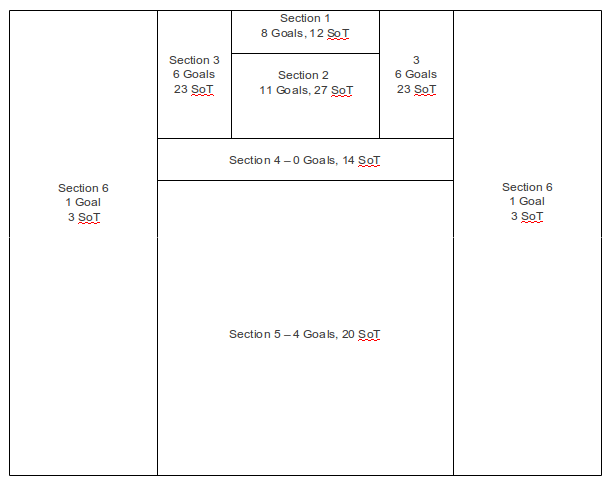 In addition to the Goal Mouth visual, here is a field map diagram as it applies to the dimension of the field. This has already been provided in raw form in the data that Matty has collected and posted in the raw shot data tab, but I wanted to have another visual to compare the above data. The problem between the two is that there is no correlation between the fact that Chicago has allowed 4 goals in section 5 to the fact that they've also allowed 5 goals in SoT1 (for ease of the tally, I gave a numerical designation to each location on the goal mouth; starting at the top and working left to right). This is the next collaborative effort that I'm working on, gathering both the shot location of origin and placement on the goal, and from what specific individual at what time. This is a very time-intensive task and it'll probably take me the rest of the week to complete it just for Chicago. However, I'm taking suggestions on how I could compile this data without hand jamming it into a flat file. An SQL dump of the current Opta database for the season would go a long ways to helping compile this data and would be nice. But I'm never above a bit of hard work.